To say Exocet drivers, Randy Pobst, and Jason Owens, had a blast in the naturally aspirated 1.8L Exocet Sport all weekend, would be a huge understatement. The guys had a chance to road trip all over the Southeast this weekend, competing in autocross, time trial, track day, and road rally events. Team “Exosperimental” tore it up on day one at Charlotte Motor Speedway, then made their way over to Atlanta Motorsports Park to continue the fun. You can check out their write up here! After their fun in Georgia came to a close, the drivers turned North, to Bowling Green, Kentucky. Once at the National Corvette Museum Motorsports Park, the festivities began again. Read all about the track, and competition, in their write up on day two, here! For their closing day, the victors were decided, with an amazing “13 way dead-heat” for the drivers who had perfect scores all around. After the final road rally, all the participants joined in for the last cookout, and festivities the event had in store. Check out the final day, and competitor standings, here! 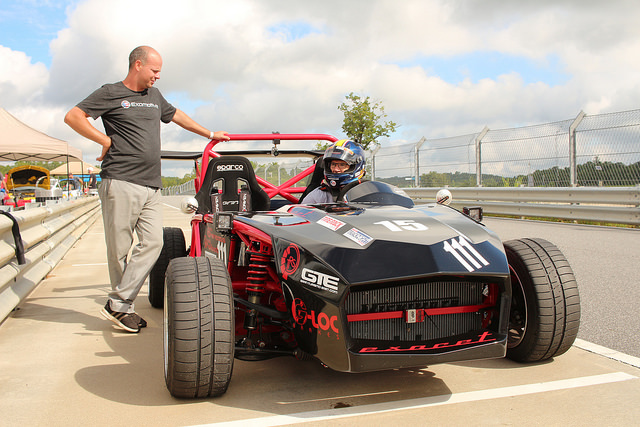 Overall, it was a great kick-off to a fresh event that showed off the Exocet’s capabilities in the hands of some amazing drivers; we’d love to participate again!